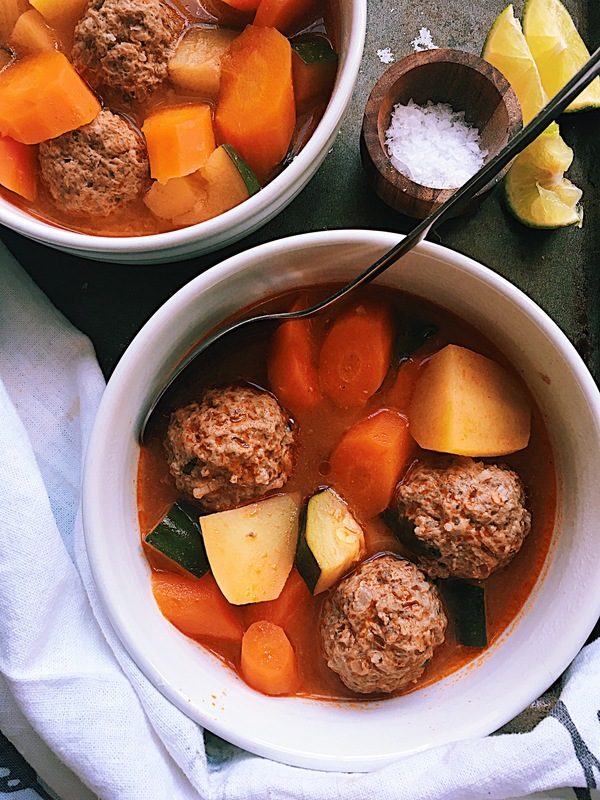 Winter is the perfect time for cosy and comfort food and today is one of those days that I just fancy some of my mum’s soups, but unfortunately she is miles away from me, so I decided to make one of her famous soups, albondigas! This is a nice cosy dish that will definitely will always take me back to my childhood, my mum would always make them on a cold winter day and we would arrived from school and the whole house would had that lovely and yummy smell!! Aw! I really miss my mum right now! The recipe is quite easy, but you need to be patience and make it with love, as my mum would say, that is the key to a nice and delicious dish. First you have to treat the meat as it is dough and work it, mix all the ingredients very well until they are properly combined, then make the broth and leave it to simmer for quite a while, to make it for grown ups you only need to add some chipotle chilli paste, after you add the meatballs and let them cook slowly, finally add the veggies you like and listo!!! The meatballs Mexican style are done! All you need after they are ready is some lime wedges and some warm corn tortillas, sit down and eat it and think that you are in Mexico, in your mum’s house! Mix all the meatballs ingredients in a large mixing bowl. Work the mince meat until getting a smooth consistency. Make the meatballs a little smaller of a golf balls. Leave aside. To make the broth. Blend the tomatoes and onion and if you are making the soup for grown ups, add the chipotle chilli, water. Heat a large sauce pan and add the oil. Once is hot add the tomato broth, once it starts boiling, add the chicken stock cube and tomato purée. Let it simmer for 10 min and add maldon salt if needed, a pinch of ground pepper and the fresh mint and coriander. Let the broth cook for 15 more min and add the meatballs. Cook the meatballs for 10 min in the broth and remove the impurities with a spoon. The add the vegetables and cook for 15 min. Once the veggies are soft the soup is ready. Enjoy it with a squeeze of lime and warm corn tortillas. The impurities is the foam the forms on top of the broth once the meatballs have been cooking for around 10 min. This soup looks so delicious, and I love that these are ingredients that I usually have on hand! I will definitely be making this. This looks sooooo good! 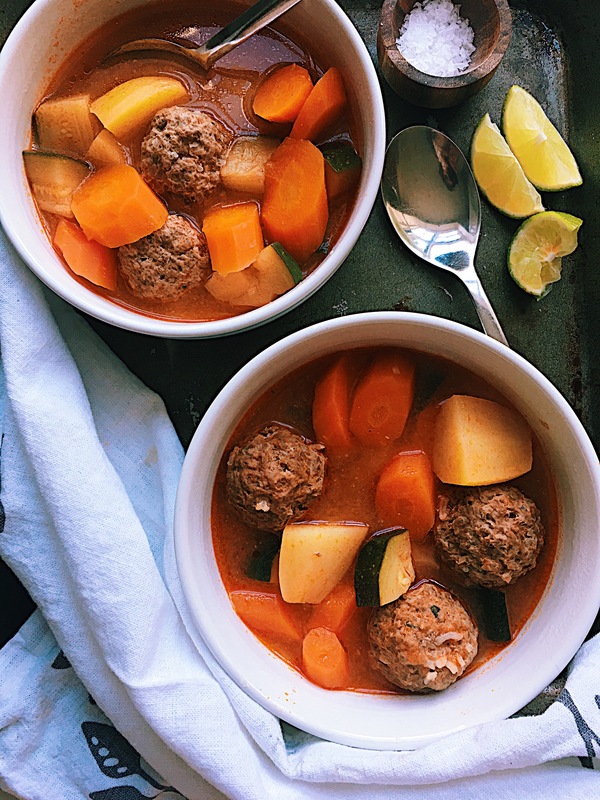 Everybody has their own meatball recipe in Mexico, but yours looks amazing. I’m going to make this!! !